For a wildlife enthusiast, holiday destinations don’t come much better than the Isle of Skye. Past visits to the west coast of Scotland have been wonderful, so the prospect of an Easter break on ‘the Misty Isle’ was met with great anticipation. Skye is a long way from Shropshire. Once you pass Glasgow, the scenery starts to open out. Loch Lomond and the Trossachs National Park whets your appetite before you enter the Highlands proper. The road winds its way up through the mountains to eventually reach Kyle of Lochalsh where a road bridge connects Skye with mainland Scotland. The island has been described as ‘Scotland in miniature’ as it has a cross-section of all the best bits of Scottish scenery. Snow-capped mountains rise up from the shores of huge sea lochs that cut deep into the island. 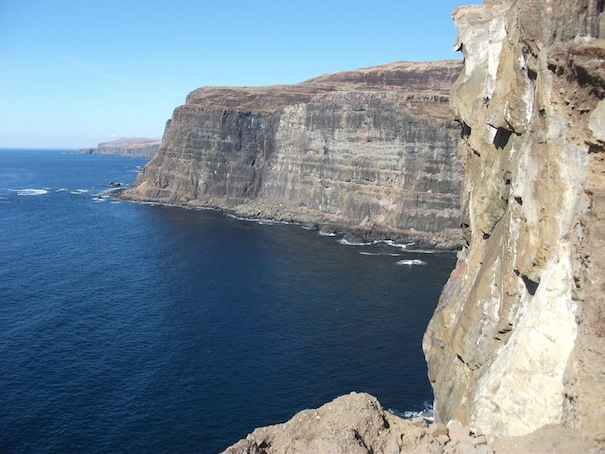 Skye has a wonderful range of habitats and is home to some charismatic species. On our first full day we set off to climb Beinn Edra. We parked the car amongst the curious landscape of ‘Fairy Glen’ - a series of miniature conical hills caused by the unique geology of the area. The sun was trying to burn through as we followed the line of an old stone wall up the hill, a long gentle trudge. Beinn Edra forms part of the Trotternish Ridge, which is gently sloping on one side and has steep cliffs on the other. We paused to take in the wonderful view across the Raasay Sound towards the mainland. Suddenly my wife spotted a large bird overhead. I could see distinctive ‘fingertips’ formed by the feathers at the tips of the wings. It was a golden eagle. The bird flew over and we got an incredible view. We could see the piercing eyes looking down at us and even watched him flex his legs before he drifted away along the ridge. This was the first of several sightings that we had of these wonderful birds on Skye. Spring is a great time to observe eagles as they can often be seen territory marking. Golden eagles are not the only species of eagle on Skye. On our last day on the island we were hiking near the pretty fishing village of Portree. We stopped on a grassy headland looking over the bay and spotted a large bird flying towards us. Through the binoculars we could see that it had a white tail and a massive wingspan. 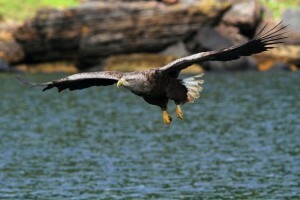 It was, of course, a white-tailed sea eagle. That sighting alone was amazing enough but later that day things got even more exciting. We were back in Portree near the harbour. People were busy eating fish and chips and going into shops and cafes. I happened to look to the sky and could not believe my eyes. Two sea eagles were circling directly over the town, silhouetted against a blue sky. After a couple of minutes we could hear them calling and soon realised why. Another sea eagle was circling higher up and this was obviously a territory dispute. Sea eagles are the largest bird in the UK and the 4th largest eagle in the world. They have an 8 foot wingspan and are sometimes called the ‘flying barn door’ because of their huge wings and relatively short white tail. They used to nest widely around the coast of the UK but were declared extinct in the UK until a re-introduction programme was instigated in 1968. Birds were transported from Norway to the Isle of Rum. They have slowly spread but are still restricted to Scotland. The sight of sea eagles over the rugged coast and golden eagles over the hills and mountains summed up the beauty of the Isle of Skye to me. These birds are synonymous with truly wild places, places where nature is still in charge. An old Welsh legend said that the souls of brave warriors flew to heaven in the form of eagles. As I gazed up at the huge shadow of a sea eagle overhead I was reminded of some prehistoric beast, a perfect combination of majestic beauty, fierce talons and pure bulk. These are indeed warriors of the sky and I felt privileged and inspired by this wildlife encounter.